Just bought it last night to replace my wife's little kia. 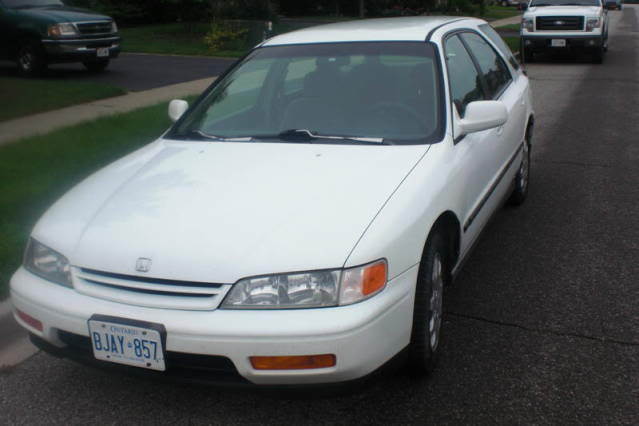 94 Accord EX wagon. F22B2 engine (non-vtec) auto. Runs great, compression was 170, 180, 180, 180psi. Lots of new parts. Lil bit o' honda rust around the rear fenders... Needs a few odds and ends, but nothing major. Some may say I'm cazy, but after looking at the car for 2 hours, it doesn't bother me that it has a colossal 417k on it. Meh. The price was right and the car is solid. All in all pretty clean and decent for the age and mileage. Last edited by MPR; 23-Sep-2010 at 10:31 PM. nice... sooo now your wife can start coming to the meets toooooo... in her car!! ^ Wow...now imagine that in white~! Really like the look of the car, Mike. She must enjoy driving it, too. 417 kms... just broken in ! Indeed. I hate it when people hear the kms and judge the car solely based on that and they haven't even seen the car in person. Getting the trip permit today and going down this evening to drive it home. Anybody wanna buy an 02 kia spectra GSX? And what's wrong with your kia? Why downgrade from 2002 to 1994? I don't consider going from any older kia (5 to 10years old+) to any even older honda as "downgrading". If you've owned an 02 spectra, you'd know how crapy it is. There is technically nothing wrong with the kia, but I do have several issues/conserns with it. I maintain it as I do with anyother car I've owned. Change the oil regularly and do any other regular maintenance as required. I replace parts as needed, when needed. It is not nearly as good on gas as it should be, it has a HORRIBLE crash test rating, it has strange and unstable handling characteristics and even stranger braking bias during heavy to extreme braking situations which I have been unable to correct or diagnose. Parts are somewhat hard to come by and can be on the pricey side. I don't want my wife driving that kind of vehicle anymore. We don't have kids yet but I wouldn't want them riding around in such a vehicle either. The accord is a much safer vehicle. More stable, controlable and much more practical. Parts are readily available and I would NEVER consider it a step down from that crap kia. Even if it had a million miles on it. Age and mileage aren't the only determining factors of what makes a car a good car. Yes it is the original engine and transmission and it still runs great. That is a testiment to honda's quality & design and results of proper maintenance and vehicle care. Hope that explains my reasoning and the whole situation a little better. Last edited by MPR; 01-Oct-2010 at 04:07 PM. Car looks clean, I don't recall seeing too many Honda wagons.